I must confess I am getting used to receiving a monthly delivery of Degustabox and I look forward to it every month. In case you are not aware, Degustabox is a monthly subscription of a surprise tasting box, that arrives at your door with 10 to 15 new and limited edition food products. We have been trying Degustabox for a few months (January Degustabox , February Degustabox, March Degustabox, April Degustabox and May Degustabox), and it only gets better each month! Wondering what we received this month? Another lovely selection of products, including food and drinks, for kids and adults. As soon as I opened the box, I noticed we received a bonus product, Shaken Udder Chocolate milkshake. We tried it in last month’s Degustabox and loved the gorgeous taste of the milkshake, made from Belgian chocolate blended with fresh British milk. 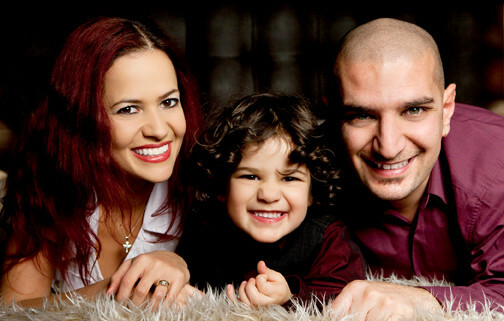 It is a success with little man! Be Fast Breakfast are, as the name indicates, breakfast on the go, suitable for those that can’t be without breakfast but don’t have much spare time – just like me. I was sent banana and vanilla flavour, they are both high in fibre, low in fat and source of protein. The bottles are very convenient, and ideal when you need to leave home in a hurry. Hubby and I were both pleased with the alcohol selection, they arrived at the right time as it has been very warm lately. Nothing like a cold drink to cool down at the end of a hot sunny day! 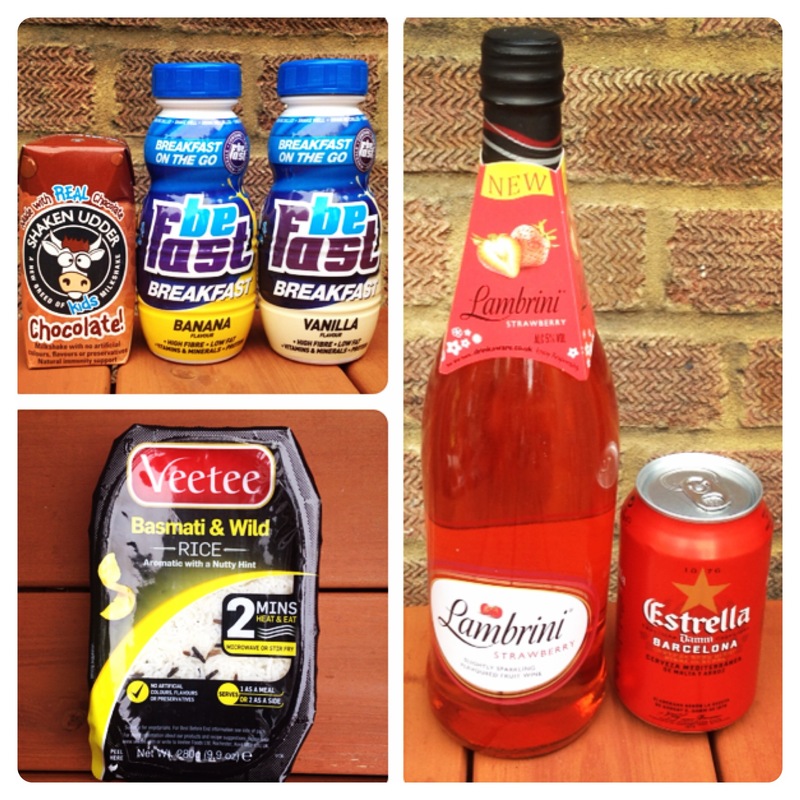 I found Lambrini Strawberry light and refreshing, while hubby enjoyed Estrella Damm, it reminded him of summer holidays. We usually have packets of rice in the cupboard, so it was nice trying a new one. Veetee Basmati & Wild is microwavable rice, ready in just two minutes. Great when you need a quick side for your meat and vegetables. I was very happy when I saw Elizabeth Shaw’s flutes this month. I was planning to bake with last month’s flutes, but they magically disappeared from the kitchen. I am yet to find out what happened to them! This month, I tried a couple of the Milk Chocolate Amaretto Flutes, and used the rest to make pancakes, together with the delicious Urban Fruit dried pineapple chunks, Bear Alphabites crunchy cereal letters, and the convenient Dr Oetker Madagascan Vanilla grinder. I’ve basically used my standard pancake recipe, then added cereal, dried pineapple, grounded vanilla and pieces of chocolate flutes to it. 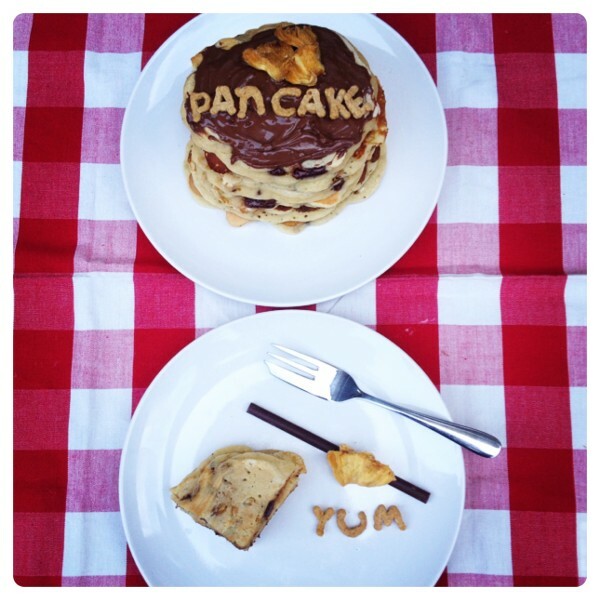 It was so tasty, the whole family enjoyed the pancakes! 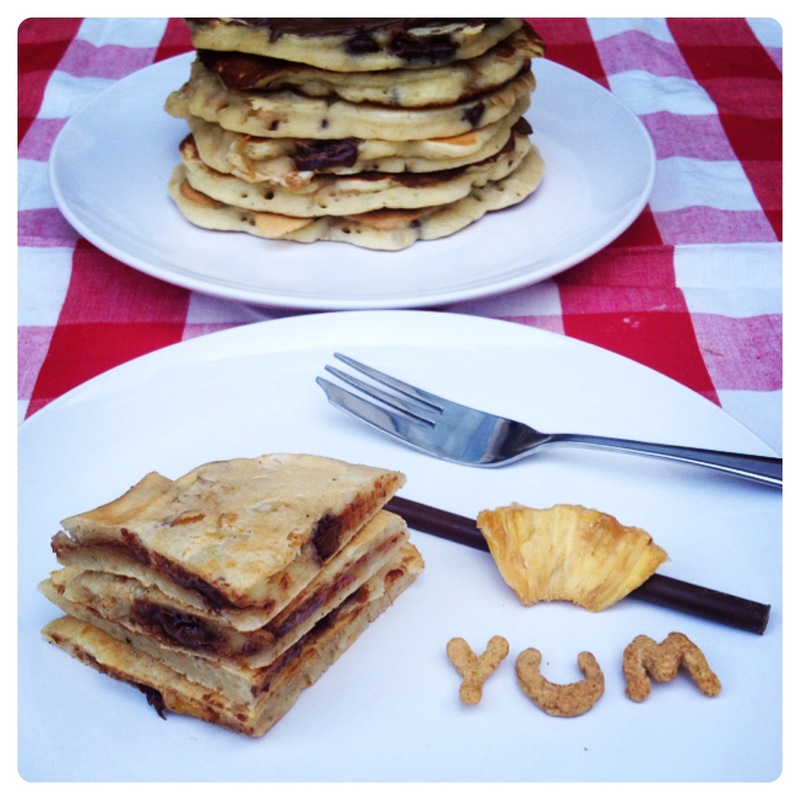 I prefer fluffy American style pancakes, but you can use plain flour if you prefer think pancakes. 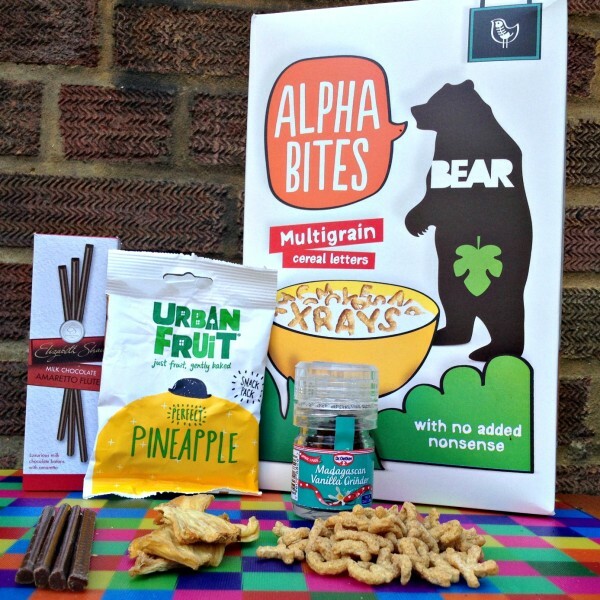 I should add that Bear Alphabites cereal is delicious as a breakfast cereal, little man loves it and so does hubby. I really liked grinding Madagascan Vanilla over my porridge, yummy! Mix the self-raising flour, milk and egg in a large bowl until you have a smooth batter. Add the mashed banana, cereal, 5 broken milk chocolate flutes, dried pineapple and grounded vanilla. Heat a non-sticking frying pan over a medium heat and add a knob of butter. 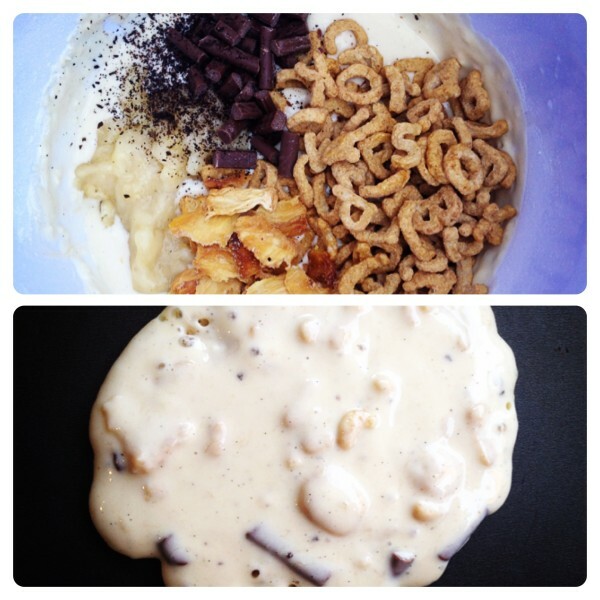 Once melted, add a ladle of batter (you could add more batter, depending how big your frying pan is). Once the top of the pancake begins to bubble, turn it over and cook until both sides are golden brown. Repeat until all the batter is used up. 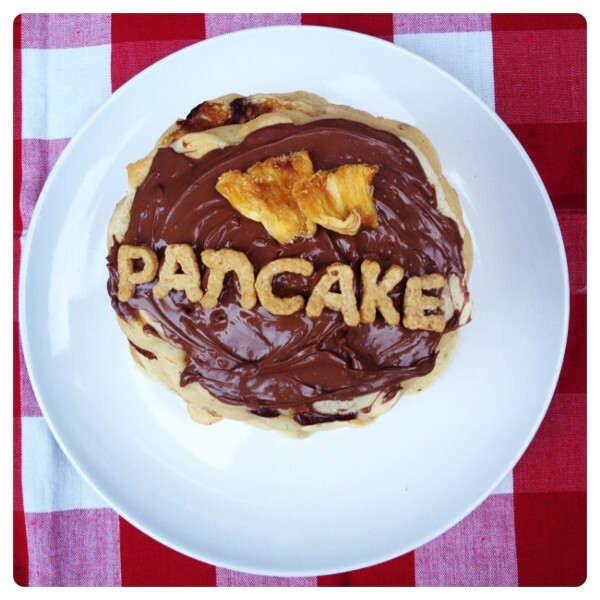 Stack the pancakes, decorate with melted chocolate from the remaining 10 milk chocolate flutes and a couple of dried pineapple. Serve. We loved the pancakes and we will be making them again soon! 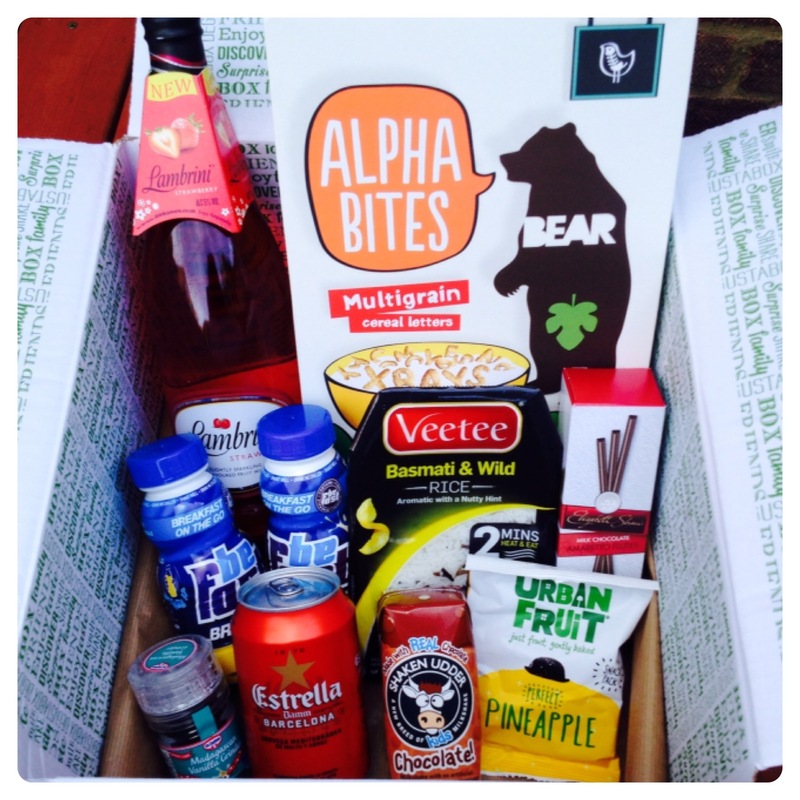 In case you haven’t tried Degustabox before, you can use the code KOMD1 to receive £3.00 off when registering. 8 Responses to "Degustabox June Edition & Pinepple Aphabites Cereal Pancake Recipe"
Great idea, I just ate my pineapple out of the bag! That pancakes looks really tasty!